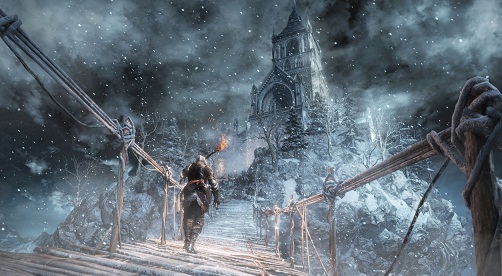 Ashes of Ariandel, the first of two planned expansion for Dark Souls 3, brings a PVP Arena. After you started the new expansion and familiarized yourself with the new area, the question remains about the location of the PVP Arena. This can be unlocked after a certain boss fight, for which you get an item that you have to burn in the Firelink Shrine. The unlock of the PVP Arena is related to the new boss "Gravetender". He and his big wolf must be defeated at the bottom of the new area "Painted World of Ariandel". Then he leaves a "Valorheart Weapon" and the "Champion's Bone" for you. With this item in your luggage, you have to go back to the Firelink Shrine and get to the bonfire. Here you will see the option "Burn the Champion’s Bones ". Choose this option and you can now participate in undead matches in the PVP Arena. If you want to find the PVP-Arena quickly, then follow the guide given below. - At the beginning of the DLC you come to a long Rope Bridge. Cross it. - Once you have reached to the other end, hit the bridge so that it will destroy. - Now use the remains of the bridge to climb down. - Then use the large roots to go all the way down to the bottom. - Be careful not to fall down and don’t be hit by the arrows of the enemies that are exploding after a short time. - On the ground, you will find a bonfire in the recess in the wall as a checkpoint in front of the boss. - Follow the path to the right to the Master "Gravetender". Before the start of an undead match you have to choose one of eight different match formats. - Duel: 1-against-1 - Fighting, until only one stands. You should not use Estus Flasks in this game mode and only limit the Undead Bone Shard. - 2 Player Fight: This is where everyone fights on their own, with the aim of recording the most kills within a certain time limit. Estus Flasks and Undead Bone Shard may be used only to a limited extent..
- 4 Player Fight: Here, too, you fight for yourselves. It's about getting the most kills within a certain time limit. Estus Flasks and Undead Bone Shard may be used only to a limited extent. - 6 Player Fight: You fight for yourself again. But it's about getting a lot of kills within a certain time limit. Estus Flasks and Undead Bone Shard may be used only to a limited extent. - Combat / Brawl (group): Join a 4-player battle or a 6-player battle. - 2 vs 2: Here, the fighters are divided into the two teams and then have to make as many kills as possible in a certain time limit in order to win. Estus Flasks and Undead Bone Shard may be used only to a limited extent. - 3 vs 3: Again, the fighters are divided into two teams and then have to make as many kills as possible in a certain time limit to win. Estus Flasks and Undead Bone Shard may be used only to a limited extent. - Co-op match (group): Join a 2 against 2 or a 3 against 3. Then you can decide for an arena. If you want to fight with your friends in the arena, you can also set a password for the game search. Then you just have to click on "Match" and wait until enough players have come together for a fight.